As their tradition calls, Indian weddings showcase the mandap decorations as the biggest attraction representing their cultural values. The mandap is held as a four-pole canopy mostly at the center of the stage. Although the style or décor of the mandap can change depending on the region, but the basic concept of blessing the to-be couple while they tie “mangalsutra” and do “pheres” remains the same. While today, a mandap is also used in pre-wedding ceremonies such as engagement. Given the importance of mandap decorations, let’s explore in what ways it can be catered in any Indian wedding in New Jersey. Combinations of red and silver can be used which accounts for a traditional décor mandaps are mostly recognized with. However golden color can also be used which is quite common to be seen in Indian weddings. Deep gold and red are the core essence of a mandap. In addition to these, you can also use catchy colors such as green, pink, etc. especially when you have selected a distinctive theme for the mandap décor. Flowers both artificial and natural can really light up the mandap canopy. Also wall hanging and some bright artifacts used can give the mandap a touch of flowery elegance. Marigold, jasmine, and roses are high-scented flowers that keep the traditional look and feel of the mandap intact. The canopy can be covered with a bunch of roses and marigold garlands. Attach the garlands loosely around the canopy pillars. A westernized theme can be chosen if the bride and groom wants to try something apart from a traditional approach. Using netted drapes, covering the mandap with silver instead of golden, and spreading flowers like baby roses, lilies, orchid, carnations, etc. is surely going to make your mandap stand apart from all traditional ones. Wrapping silk drapes around the canopy pillars is a beautiful alternate in case you are unable to acquire garlands. Do note the silk drapes should match the overall color scheme selected for the mandap. The backdrop should look as amazing as you can go. One great way to display an attractive backdrop is by hanging a collection of exotic flowers through the center at the back of the mandap. Spread a bright colored carpet around the mandap area. But do see the flowers used for the backdrop should not mix with the color of the carpet. Lighting is easily one of the most important aspects in mandap decorations. It is important the lighting used should be able to lighten up the mandap all different from the rest of the wedding venue areas. One classy way is by using strips of yellows lights. For budget reasons, LED lights are the best to come up with. While if the budget allows you can also try expensive lighting fixtures. A couple of chairs are always used in a mandap for bride and groom. 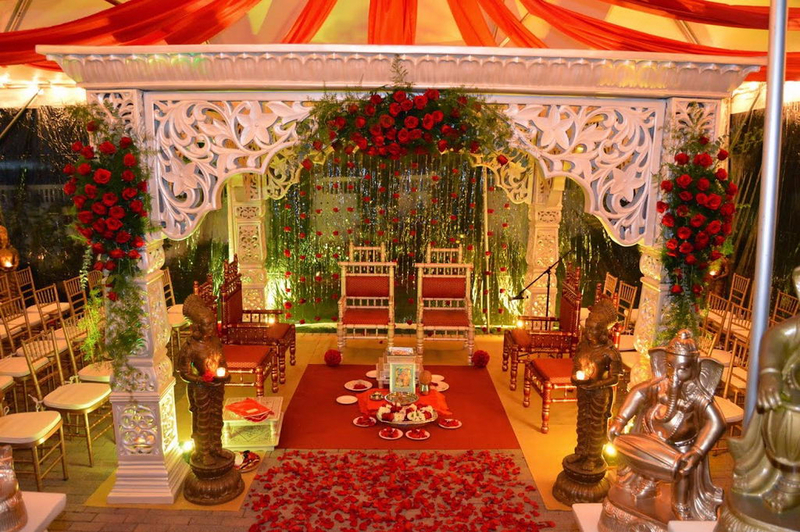 So ensure that the chairs and their cloth blend in well with the overall color theme of the mandap.